There’s a section of River Road that is so dangerous it’s long been known as “dead man’s corner,” said Councilor Timothy Nangle at the December 19 town council meeting. Further discussion about traffic safety accentuated the idea that while River Road is certainly a concern, it’s not the only place where traffic safety is an issue. “Some kind of public awareness is warranted,” said Town Manager Tony Plante during the discussion. Everybody is in a hurry these days, Plante said, but it only takes a second of inattention for a tragedy to occur. “We’ve seen that all too recently in the tragedy that occurred on River Road, which really brought this whole subject up,” he said. Nangle asked that discussion about River Road be put on a future town council meeting agenda, and suggested having representatives from the DOT come to discuss how to make River Road safer, especially with additional construction slated to begin soon. Plante said that has not yet been scheduled, but that at some point they will have the conversation about that section of road, where safety seems to be an ongoing issue. He emphasized that the broader issue of reminding people to slow down and pay attention is also very important. “All too many times, it seems people get in a car and pick up a phone, thinking, ‘I’m only driving.’ Driving should command your attention,” he said. Windham Police Department Captain William Andrew offered some safety tips in an interview on January 5; “Anything we can do to try and reduce the number of accidents is a benefit to everybody,” he said. “Speed is one of the biggest impacts,” Andrew said. Slowing down is one of the best ways to prevent accidents. Give yourself room between yourself and the car in front of you. Reduce distractions in your vehicle and keep your attention focused on what is going on around you from all directions. Accidents involving deer and other animals happen more often this time of year, so being aware of what is happening on all sides is important. If you see a vehicle following too closely, pull over and let them pass. Keep an eye on changing speed limits. This is particularly true on River Road, Andrew said, where the speed limits vary a great deal from one end to the other. Give yourself extra time in inclement weather. Clear snow and ice off the top of the car. Failure to do so can cause whiteout conditions for other drivers or pedestrians, and debris can fly off the top and cause damage to windshields, or hit pedestrians. Utilize features inside your car that are designed for safety. This includes sun visors, particularly at sunrise and sunset. “They’re not just there to hold your garage door opener,” said Andrew. Mirrors are also an important tool, and can help you identify when someone is following too closely. 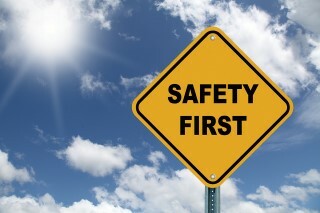 Equipment you can bring with you, such as sunglasses, can also boost safety. Keep your vehicle clean and free of debris. This is especially important in the driver’s area and floor, Andrew said, because if something, like a water bottle, rolls under the brake pedal it could make it impossible to stop. Making sure you keep the windshields, inside and out, clean is also important, he said, as a dirty windshield makes visibility worse. Make sure your car is in good, safe operating order. This includes checking fluids such as windshield wiper fluid to be sure it’s there when you need it. AAA also has safety tips on their website, Andrew said.